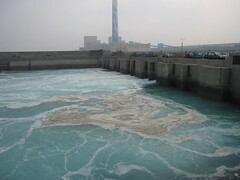 See the Save the Humpback dolphin blog* for recent images of Taichung coal-fired power plant (the biggest CO2-emitting power plant in the world), whose effluent flows into humpback dolphin habitat. Proponents of more coal-fired power plants on the coast adjacent to the dolphins' habitat argue that, because the dolphins still swim in these waters, additional effluent from more coal-fired power plants will not affect them. In fact, the dolphins are restricted to these waters--they have no where else to go, no matter how much we degrade their home. emitting power plant, Taichung. 10.5.09. * The Save the humpback dolphin blog is run by Matsu's Fish Conservation Union, a coalition of Taiwanese environmental NGOs working to protect Taiwan's humpback dolphins, otherwise known as "Matsu's Fish". The member groups are: Taiwan Academy of Ecology; Taiwan Sustainable Union; Taiwan Environmental Protection Union; Wild at Heart Legal Defense Association; Wild Bird Society of Yunlin and Changhua Coast Conservation Action.